During the American Society of Hematology’s Annual Meeting in December 2018, real-world data were presented showing the significant burden of hospital readmissions for venous thromboembolism (VTE) among individuals with cancer. Alpesh N. Amin, MD, MBA, lead investigator of the study, discussed the findings and their relevance, highlighting the need for more investigation and the implementation of measures to manage patients at risk for VTE with in-hospital and postdischarge prophylaxis. Following is a summary of the study results. Patients with cancer or who have a history of cancer are at an increased risk of developing venous thromboembolism (VTE) events, which often manifest as deep vein thromboses or pulmonary embolisms (PEs).1 Data suggest that appropriate thromboprophylaxis in these patients is both challenging and underutilized.2 Patients who are not receiving appropriate thromboprophylaxis are at risk for developing VTE events, which may require rehospitalization. The clinical and economic burden of VTE-related hospital readmissions among these patients is not well understood in the real-world setting. To analyze the frequency and associated cost of VTE-related hospital readmissions among patients with cancer in the United States, investigators compared a population of patients who were hospitalized for acute medical illnesses, including heart failure, respiratory diseases, ischemic stroke, cancer, infectious diseases, and rheumatic disease (N = 12,785), with a subpopulation of patients hospitalized for cancer (n = 2002).3 Patients were identified from the MarketScan database, which captures discharge diagnosis codes, between July 1, 2011, to March 31, 2015. The first hospitalization was classified as the index hospitalization. Patients were required to have 6 months of continuous insurance coverage at the baseline period and during the follow-up period of the index hospitalization event, allowing for 1 year of continuous data. Outcome measurements included: (1) proportion of patients readmitted for VTE-related or primary VTE discharge diagnosis, (2) time to VTE readmission from discharge, and (3) associated costs of readmissions for patients with a primary discharge diagnosis of VTE. Patients hospitalized for cancer were younger than all acute medically ill patients. Among acute medically ill patients, 44% were <65 years compared with 62% in the cancer population. Other baseline demographics are shown in the Table. Off all patients hospitalized for acute medical illness, 15.7% were hospitalized for cancer. Mean length of hospital stay (5.2 days) was the same for all patients compared with patients hospitalized for cancer. 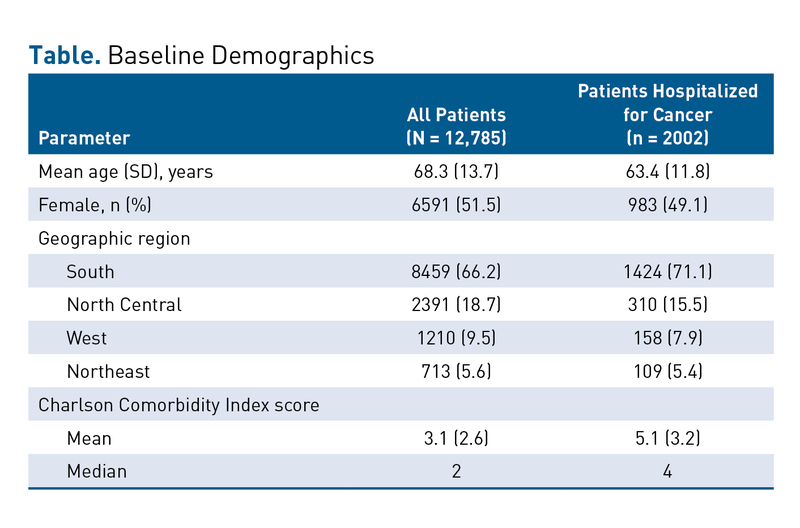 Rates of readmission for any VTE during the 6-month follow-up period were higher among patients hospitalized with cancer (3.9%; 51.3% of these readmissions were for primary VTE) compared with all acute medically ill patients (2.1%; 36.6% of these readmissions were for primary VTE). 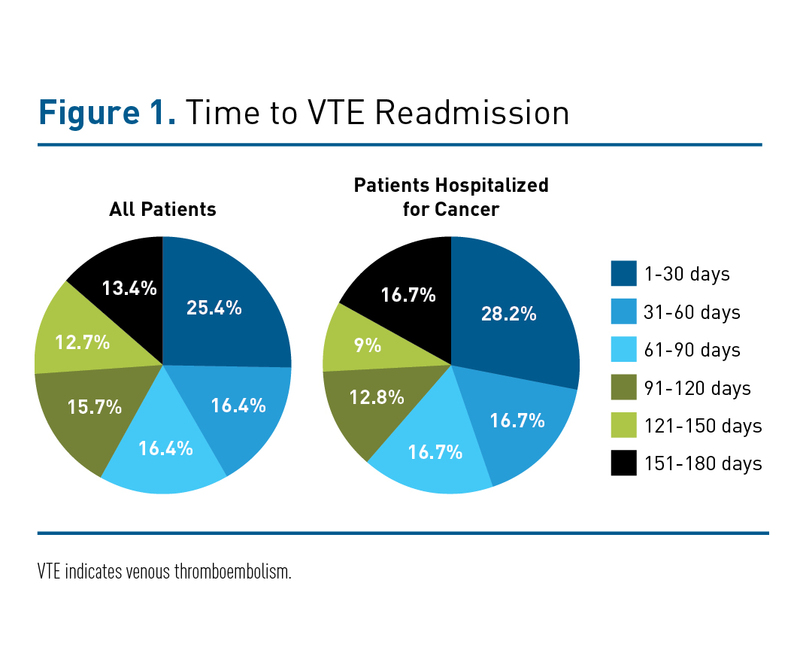 As shown in Figure 1, over one quarter of the patients were readmitted for VTE within 30 days of discharge (28.2% of patients with cancer vs 25.4% of all acute medically ill patients). The mean length of stay associated with VTE-related hospital readmissions was 7.6 days for primary VTE for patients initially hospitalized for cancer compared with 9.4 days for all acute medically ill patients. The mean length of stay associated with readmission for primary VTE was 5.2 days for patients with cancer and 5 days for acutely ill patients. As shown in Figure 2, costs associated with VTE-related readmissions were $35,102 for patients with cancer versus $42,158 for all acute medically ill. For primary VTE-related events, the mean costs for rehospitalization were $19,961 vs $18,681, respectively. Potential limitations of this study are related to the MarketScan database, which can generate errors resulting from erroneous coding entry or the database itself. Additionally, the database may not be reflective of the United States population because the majority of MarketScan claims are in the South Census region, abiding by that region’s standard of care, compared with other regions of the United States. Nevertheless, MarketScan is generally considered to have a healthy amount of data. With over 30% of cancer patients being readmitted for VTE within 30 days postdischarge, the results of this real-world study suggest that prophylaxis is underutilized in this population in the United States. 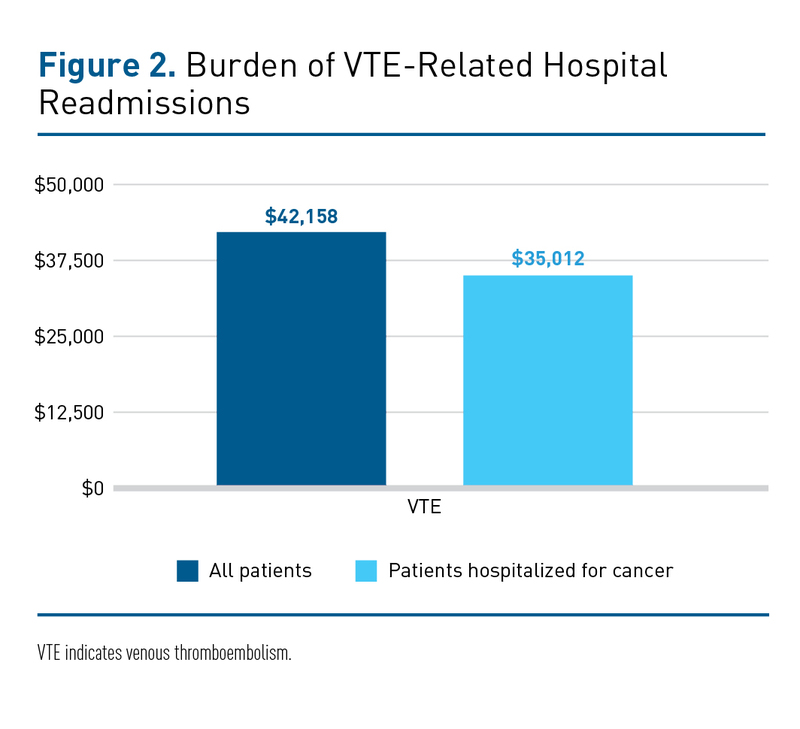 Moreover, the economic burden of VTE readmissions for patients with cancer, as well as for patients with other acute medical illnesses, is significant.